Lew Racing uses advanced manufacturing techniques to build the strongest 880 gram wheel set in the world PERIOD. DEX-LCM is a special technique developed for the Department of Defense (DOD) by Lew Aerospace and is now applied to Lew Racing Wheels which combines Boron and Carbon to produce the PRO VT-1 laminate. Carbon-epoxy rims with stainless steel spokes cannot compete with the lateral stiffness and precise roundness of the PRO VT-1 wheelset. The unique spoke design, while traditional in appearance never needs adjusting as each individual spoke is precisely inserted to create zero residual stress in the wheel. Applying aerospace technology from unmanned aircraft, Lew Racing Wheels has designed a new low-drag airfoil section like no other that will challenge the world's best road-racing and time-trial wheels all in one highly precise wheel set. Each wheel is dynamically balanced and is manufactured to conform to aerospace and DOD standards. The wheel is designed for racing, but you'll want to ride it every day. On April 12, 2007 at the Sea Otter Classic Rob Anderson riding for the AMD Discovery Channel Masters Team soloed from the feed zone in the first lap and rode the next 4 and a half laps on his own to win the race. He was ecstatic with his Lew PRO VT-1. Congratulations to Rob from LEW RACING on his victory. Visit our website for more news and information on the PRO VT-1. Lew Racing will be conducting dealer training and demos at Red Rock Resort during Interbike 2007. 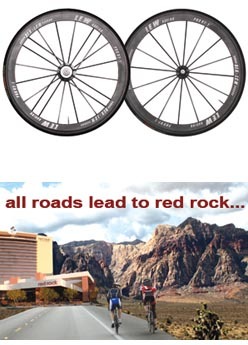 The first 50 authorized Lew Racing Dealers will receive a free room at Red Rock Resort during Interbike. Click the link below to register now and have your bike shop listed on our website as a Lew Dealer. Las Vegas!! A town known for its ability to deliver ultimate experiences is now the home of the ultimate bicycling experience. Through a unique partnership with Lew Racing, Cannondale Bikes and the billion-dollar Red Rock Casino Resort Spa you can now experience the strongest and lightest wheel set in the world, in one of the most beautiful places on Earth...the Red Rock Canyon National Conservation Area. During your stay at the Red Rock Casino Resort Spa you will have access to Lew Racing's revolutionary 880 gram PRO VT-1 wheel set which you will test ride on Cannondale's System Six or Synapse Carbon SL-1. If after, or during, your stay at the Red Rock Casino Resort Spa you decide you'd like to permanently elevate your biking experience to the best in the world, you'll receive a $500 discount towards the purchase of a PRO VT-1 wheel set. Face it, there is no downside here. If you're serious about your commitment to cycling you owe it to yourself to take advantage of this ultimate cycling experience. Clink the link below to visit the Red Rock Resort Adventure Spa site and book your demo ride today!